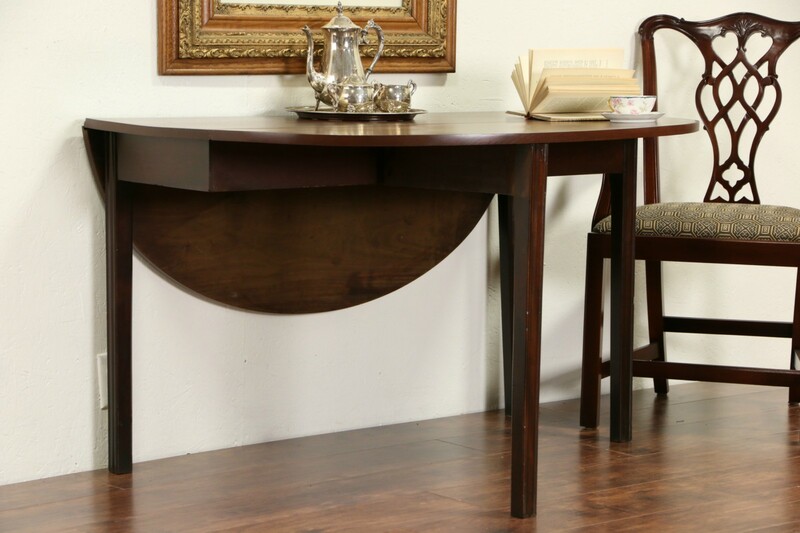 A beautiful genuine oval dropleaf dining sofa or hall table is from the Georgian period about 1780. Solid mahogany with an excellent satiny finish, the top and drop leaves are cut from single wide planks of richly figured solid mahogany. Gatelegs swing out on hand carved wooden hinges to support the dropleaves. Hand cut nails and planing marks are visible underneath this sturdy and durable stately antique furniture from England. There is a small shrinkage separation from age, see photos. One leg has an old restoration, another has a warp from age. Measurements when closed are 48" long, 19" wide and 28 1/2" tall, open size is 51" x 48."